In physics, the concept of force is used to describe an influence which causes a free body to undergo an acceleration. Force can also be described by intuitive concepts such as a push or pull that can cause an object with mass to change its velocity (which includes to begin moving from a state of rest), i.e., to accelerate, or which can cause a flexible object to deform. An applied force has both magnitude and direction, making it a vector quantity. Newton's second law can be formulated to state that an object with a constant mass will accelerate in proportion to the net force acting upon and in inverse proportion to its mass, an approximation which breaks down near the speed of light. Newton's original formulation is exact, and does not break down: this version states that the net force acting upon an object is equal to the rate at which its momentum changes. Related concepts to accelerating forces include thrust - any force which increases the velocity of the object, drag - any force which decreases the velocity of any object, and torque - the tendency of a force to cause changes in rotational speed about an axis. Forces which do not act uniformly on all parts of a body will also cause mechanical stresses, a technical term for influences which cause deformation of matter. While mechanical stress can remain embedded in a solid object, gradually deforming it, mechanical stress in a fluid determines changes in its pressure and volume. Philosophers in antiquity used the concept of force in the study of stationary and moving objects and simple machines, but thinkers such as Aristotle and Archimedes retained fundamental errors in understanding force, due to an incomplete understanding of the sometimes non-obvious force of friction, and a consequently inadequate view of the nature of natural motion. When the Age of Enlightenment began, Sir Isaac Newton corrected these misunderstandings with mathematical insight that remained unchanged for nearly three hundred years. By the early 20th century, Einstein developed a theory of relativity that correctly predicted the action of forces on objects with increasing momenta near the speed of light, and also provided insight into the "forces" produced by gravitation and inertia. With modern insights into quantum mechanics and technology that can accelerate particles close to the speed of light, particle physics has devised a Standard Model to describe forces between particles smaller than atoms. The Standard Model predicts that exchange particles called gauge bosons are the fundamental means by which forces are emitted and absorbed. Only four main interactions are known: in order of decreasing strength, they are: strong, electromagnetic, weak, and gravitational. High-energy particle physics observations made during the 1970s and 1980s confirmed that the weak and electromagnetic forces are expressions of a more fundamental electroweak interaction. Aristotle famously described a force as anything which causes an object to undergo "unnatural motion"
Since antiquity, the concept of force has been recognized as integral to the functioning of each of the simple machines. The mechanical advantage given by a simple machine allowed for less force to be used in exchange for that force acting over a greater distance. Analysis of the characteristics of forces ultimately culminated in the work of Archimedes who was especially famous for formulating a treatment of buoyant forces inherent in fluids. Aristotle provided a philosophical discussion of the concept of a force as an integral part of Aristotelian cosmology. In Aristotle's view, the natural world held four elements that existed in "natural states". Aristotle believed that it was the natural state of objects with mass on Earth, such as the elements water and earth, to be motionless on the ground and that they tended towards that state if left alone. He distinguished between the innate tendency of objects to find their "natural place" (e.g., for heavy bodies to fall), which led to "natural motion", and unnatural or forced motion, which required continued application of a force. This theory, based on the everyday experience of how objects move, such as the constant application of a force needed to keep a cart moving, had conceptual trouble accounting for the behavior of projectiles, such as the flight of arrows. The place where forces were applied to projectiles was only at the start of the flight, and while the projectile sailed through the air, no discernible force acts on it. Aristotle was aware of this problem and proposed that the air displaced through the projectile's path provided the needed force to continue the projectile moving. This explanation demands that air is needed for projectiles and that, for example, in a vacuum, no projectile would move after the initial push. Additional problems with the explanation include the fact that air resists the motion of the projectiles. These shortcomings would not be fully explained and corrected until the seventeenth century work of Galileo Galilei, who was influenced by the late medieval idea that objects in forced motion carried an innate force of impetus. Galileo constructed an experiment in which stones and cannonballs were both rolled down an incline to disprove the Aristotelian theory of motion early in the seventeenth century. He showed that the bodies were accelerated by gravity to an extent which was independent of their mass and argued that objects retain their velocity unless acted on by a force, for example friction. 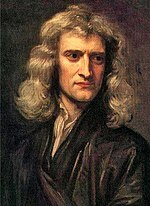 Sir Isaac Newton sought to describe the motion of all objects using the concepts of inertia and force, and in doing so, he found that they obey certain conservation laws. In 1687, Newton went on to publish his thesis Philosophiae Naturalis Principia Mathematica. In this work, Newton set out three laws of motion that to this day are the way forces are described in physics. Newton's first law of motion states that objects continue to move in a state of constant velocity unless acted upon by an external net force or resultant force. This law is an extension of Galileo's insight that constant velocity was associated with a lack of net force (see a more detailed description of this below). Newton proposed that every object with mass has an innate inertia that functions as the fundamental equilibrium "natural state" in place of the Aristotelian idea of the "natural state of rest". That is, the first law contradicts the intuitive Aristotelian belief that a net force is required to keep an object moving with constant velocity. By making rest physically indistinguishable from non-zero constant velocity, Newton's first law directly connects inertia with the concept of relative velocities. Specifically, in systems where objects are moving with different velocities, it is impossible to determine which object is "in motion" and which object is "at rest". In other words, to phrase matters more technically, the laws of physics are the same in every inertial frame of reference, that is, in all frames related by a Galilean transformation. For example, while traveling in a moving vehicle at a constant velocity, the laws of physics do not change from being at rest. A person can throw a ball straight up in the air and catch it as it falls down without worrying about applying a force in the direction the vehicle is moving. This is true even though another person who is observing the moving vehicle pass by also observes the ball follow a curving parabolic path in the same direction as the motion of the vehicle. It is the inertia of the ball associated with its constant velocity in the direction of the vehicle's motion that ensures the ball continues to move forward even as it is thrown up and falls back down. From the perspective of the person in the car, the vehicle and every thing inside of it is at rest: It is the outside world that is moving with a constant speed in the opposite direction. Since there is no experiment that can distinguish whether it is the vehicle that is at rest or the outside world that is at rest, the two situations are considered to be physically indistinguishable. Inertia therefore applies equally well to constant velocity motion as it does to rest. The concept of inertia can be further generalized to explain the tendency of objects to continue in many different forms of constant motion, even those that are not strictly constant velocity. The rotational inertia of planet Earth is what fixes the constancy of the length of a day and the length of a year. Albert Einstein extended the principle of inertia further when he explained that reference frames subject to constant acceleration, such as those free-falling toward a gravitating object, were physically equivalent to inertial reference frames. This is why, for example, astronauts experience weightlessness when in free-fall orbit around the Earth, and why Newton's Laws of Motion are more easily discernible in such environments. If an astronaut places an object with mass in mid-air next to herself, it will remain stationary with respect to the astronaut due to its inertia. This is the same thing that would occur if the astronaut and the object were in intergalactic space with no net force of gravity acting on their shared reference frame. This principle of equivalence was one of the foundational underpinnings for the development of the general theory of relativity. Though Sir Isaac Newton's most famous equation is , he actually wrote down a different form for his second law of motion that did not use differential calculus. where is the momentum of the system, and is the net (vector sum) force. In equilibrium, there is zero net force by definition, but (balanced) forces may be present nevertheless. In contrast, the second law states an unbalanced force acting on an object will result in the object's momentum changing over time. where m is the mass and is the velocity. It is sometimes called the "second most famous formula in physics". Newton never explicitly stated the formula in the reduced form above. Newton's second law asserts the proportionality of acceleration and mass to force. Accelerations can be defined through kinematic measurements. However, while kinematics are well-described through reference frame analysis in advanced physics, there are still deep questions that remain as to what is the proper definition of mass. General relativity offers an equivalence between space-time and mass, but lacking a coherent theory of quantum gravity, it is unclear as to how or whether this connection is relevant on microscales. With some justification, Newton's second law can be taken as a quantitative definition of mass by writing the law as an equality; the relative units of force and mass then are fixed. The use of Newton's second law as a definition of force has been disparaged in some of the more rigorous textbooks, because it is essentially a mathematical truism. The equality between the abstract idea of a "force" and the abstract idea of a "changing momentum vector" ultimately has no observational significance because one cannot be defined without simultaneously defining the other. What a "force" or "changing momentum" is must either be referred to an intuitive understanding of our direct perception, or be defined implicitly through a set of self-consistent mathematical formulas. Notable physicists, philosophers and mathematicians who have sought a more explicit definition of the concept of "force" include Ernst Mach, Clifford Truesdell and Walter Noll. This means that in a closed system of particles, there are no internal forces that are unbalanced. That is, action-and-reaction pairs of forces shared between any two objects in a closed system will not cause the center of mass of the system to accelerate. The constituent objects only accelerate with respect to each other, the system itself remains unaccelerated. Alternatively, if an external force acts on the system, then the center of mass will experience an acceleration proportional to the magnitude of the external force divided by the mass of the system. which is the conservation of linear momentum. Using the similar arguments, it is possible to generalizing this to a system of an arbitrary number of particles. This shows that exchanging momentum between constituent objects will not affect the net momentum of a system. In general, as long as all forces are due to the interaction of objects with mass, it is possible to define a system such that net momentum is never lost nor gained. Free-body diagrams of an object on a flat surface and an inclined plane. Forces are resolved and added together to determine their magnitudes and the resultant. Historically, forces were first quantitatively investigated in conditions of static equilibrium where several forces canceled each other out. Such experiments demonstrate the crucial properties that forces are additive vector quantities: they have magnitude and direction. When two forces act on an object, the resulting force, the resultant, can be determined by following the parallelogram rule of vector addition: the addition of two vectors represented by sides of a parallelogram, gives an equivalent resultant vector which is equal in magnitude and direction to the transversal of the parallelogram.. The magnitude of the resultant varies from the difference of the magnitudes of the two forces to their sum, depending on the angle between their lines of action. Free-body diagrams can be used as a convenient way to keep track of forces acting on a system. Ideally, these diagrams are drawn with the angles and relative magnitudes of the force vectors preserved so that graphical vector addition can be done to determine the resultant. Equilibrium occurs when the resultant force acting on a point particle is zero (that is, the vector sum of all forces is zero). When dealing with an extense body, it is also necessary that the net torque in it is 0. Static equilibrium was understood well before the invention of classical mechanics. Objects which are at rest have zero net force acting on them. The simplest case of static equilibrium occurs when two forces are equal in magnitude but opposite in direction. For example, an object on a level surface is pulled (attracted) downward toward the center of the Earth by the force of gravity. At the same time, surface forces resist the downward force with equal upward force (called the normal force). The situation is one of zero net force and no acceleration. Pushing against an object on a frictional surface can result in a situation where the object does not move because the applied force is opposed by static friction, generated between the object and the table surface. For a situation with no movement, the static friction force exactly balances the applied force resulting in no acceleration. The static friction increases or decreases in response to the applied force up to an upper limit determined by the characteristics of the contact between the surface and the object. A static equilibrium between two forces is the most usual way of measuring forces, using simple devices such as weighing scales and spring balances. For example, an object suspended on a vertical spring scale experiences the force of gravity acting on the object balanced by a force applied by the "spring reaction force" which equals object's weight. Using such tools, some quantitative force laws were discovered: that the force of gravity is proportional to volume for objects of constant density (widely exploited for millennia to define standard weights); Archimedes' principle for buoyancy; Archimedes' analysis of the lever; Boyle's law for gas pressure; and Hooke's law for springs. These were all formulated and experimentally verified before Isaac Newton expounded his three laws of motion. Dynamical equilibrium was first described by Galileo who noticed that certain assumptions of Aristotelian physics were contradicted by observations and logic. Galileo realized that simple velocity addition demands that the concept of an "absolute rest frame" did not exist. Galileo concluded that motion in a constant velocity was completely equivalent to rest. This was contrary to Aristotle's notion of a "natural state" of rest that objects with mass naturally approached. 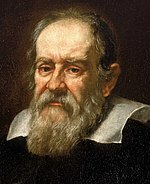 Simple experiments showed that Galileo's understanding of the equivalence of constant velocity and rest to be correct. For example, if a mariner dropped a cannonball from the crow's nest of a ship moving at a constant velocity, Aristotelian physics would have the cannonball fall straight down while the ship moved beneath it. Thus, in an Aristotelian universe, the falling cannonball would land behind the foot of the mast of a moving ship. However, when this experiment is actually conducted, the cannonball always falls at the foot of the mast, as if the cannonball knows to travel with the ship despite being separated from it. Since there is no forward horizontal force being applied on the cannonball as it falls, the only conclusion left is that the cannonball continues to move with the same velocity as the boat as it falls. Thus, no force is required to keep the cannonball moving at the constant forward velocity. Moreover, any object traveling at a constant velocity must be subject to zero net force (resultant force). This is the definition of dynamical equilibrium: when all the forces on an object balance but it still moves at a constant velocity. A simple case of dynamical equilibrium occurs in constant velocity motion across a surface with kinetic friction. In such a situation, a force is applied in the direction of motion while the kinetic friction force exactly opposes the applied force. This results in a net zero force, but since the object started with a non-zero velocity, it continues to move with a non-zero velocity. Aristotle misinterpreted this motion as being caused by the applied force. However, when kinetic friction is taken into consideration it is clear that there is no net force causing constant velocity motion. Relativistic force does not produce a constant acceleration, but an ever decreasing acceleration as the object approaches the speed of light. Note that γ is undefined for an object with a non zero rest mass at the speed of light, and the theory yields no prediction at that speed. for use in relativity through the use of four-vectors. This relation is correct in relativity when Fμ is the four-force, m is the invariant mass, and Aμ is the four-acceleration. A Feynman diagram for the decay of a neutron into a proton. The W boson is between two vertices indicating a repulsion. In modern particle physics, forces and the acceleration of particles are explained as the exchange of momentum-carrying gauge bosons. With the development of quantum field theory and general relativity, it was realized that "force" is a redundant concept arising from conservation of momentum (4-momentum in relativity and momentum of virtual particles in quantum electrodynamics). The conservation of momentum, from Noether's theorem, can be directly derived from the symmetry of space and so is usually considered more fundamental than the concept of a force. Thus the currently known fundamental forces are considered more accurately to be "fundamental interactions". When particle A emits (creates) or absorbs (annihilates) particle B, a force accelerates particle A in response to the momentum of particle B, thereby conserving momentum as a whole. This description applies for all forces arising from fundamental interactions. While sophisticated mathematical descriptions are needed to predict, in full detail, the nature of such interactions, there is a conceptually simple way to describe such interactions through the use of Feynman diagrams. In a Feynman diagram, each matter particle is represented as a straight line (see world line) traveling through time which normally increases up or to the right in the diagram. Matter and anti-matter particles are identical except for their direction of propagation through the Feynman diagram. World lines of particles intersect at interaction vertices, and the Feynman diagram represents any force arising from an interaction as occurring at the vertex with an associated instantaneous change in the direction of the particle world lines. Gauge bosons are emitted away from the vertex as wavy lines (similar to waves) and, in the case of virtual particle exchange, are absorbed at an adjacent vertex. All the forces in the universe are based on four fundamental forces. The strong and weak forces act only at very short distances, and are responsible for the interactions between subatomic particles including nucleons and compound nuclei. The electromagnetic force acts between electric charges and the gravitational force acts between masses. All other forces are based on the existence of the four fundamental interactions. For example, friction is a manifestation of the electromagnetic force acting between the atoms of two surfaces, and the Pauli Exclusion Principle, which does not allow atoms to pass through each other. The forces in springs, modeled by Hooke's law, are also the result of electromagnetic forces and the Exclusion Principle acting together to return the object to its equilibrium position. Centrifugal forces are acceleration forces which arise simply from the acceleration of rotating frames of reference. The development of fundamental theories for forces proceeded along the lines of unification of disparate ideas. For example, Isaac Newton unified the force responsible for objects falling at the surface of the Earth with the force responsible for the orbits of celestial mechanics in his universal theory of gravitation. Michael Faraday and James Clerk Maxwell demonstrated that electric and magnetic forces were unified through one consistent theory of electromagnetism. In the twentieth century, the development of quantum mechanics led to a modern understanding that the first three fundamental forces (all except gravity) are manifestations of matter (fermions) interacting by exchanging virtual particles called gauge bosons. This standard model of particle physics posits a similarity between the forces and led scientists to predict the unification of the weak and electromagnetic forces in electroweak theory subsequently confirmed by observation. The complete formulation of the standard model predicts an as yet unobserved Higgs mechanism, but observations such as neutrino oscillations indicate that the standard model is incomplete. A grand unified theory allowing for the combination of the electroweak interaction with the strong force is held out as a possibility with candidate theories such as supersymmetry proposed to accommodate some of the outstanding unsolved problems in physics. Physicists are still attempting to develop self-consistent unification models that would combine all four fundamental interactions into a theory of everything. Einstein tried and failed at this endeavor, but currently the most popular approach to answering this question is string theory. An initially stationary object which is allowed to fall freely under gravity drops a distance which is proportional to the square of the elapsed time. An image was taken 20 flashes per second. During the first 1/20th of a second the ball drops one unit of distance (here, a unit is about 12 mm); by 2/20ths it has dropped a total of 4 units; by 3/20ths, 9 units and so on. In free-fall, this force is unopposed and therefore the net force on the object is its weight. For objects not in free-fall, the force of gravity is opposed by the reactions of their supports. For example, a person standing on the ground experiences zero net force, since his weight is balanced by a normal force exerted by the ground. where the vector direction is given by , the unit vector directed outward from the center of the Earth. where r is the distance between the two objects' centers of mass and is the unit vector pointed in the direction away from the center of the first object toward the center of the second object. This formula was powerful enough to stand as the basis for all subsequent descriptions of motion within the solar system until the twentieth century. During that time, sophisticated methods of perturbation analysis were invented to calculate the deviations of orbits due to the influence of multiple bodies on a planet, moon, comet, or asteroid. The formalism was exact enough to allow mathematicians to predict the existence of the planet Neptune before it was observed. It was only the orbit of the planet Mercury that Newton's Law of Gravitation seemed not to fully explain. Some astrophysicists predicted the existence of another planet (Vulcan) that would explain the discrepancies; however, despite some early indications, no such planet could be found. When Albert Einstein finally formulated his theory of general relativity (GR) he turned his attention to the problem of Mercury's orbit and found that his theory added a correction which could account for the discrepancy. This was the first time that Newton's Theory of Gravity had been shown to be less correct than an alternative. Since then, and so far, general relativity has been acknowledged as the theory which best explains gravity. In GR, gravitation is not viewed as a force, but rather, objects moving freely in gravitational fields travel under their own inertia in straight lines through curved space-time – defined as the shortest space-time path between two space-time events. From the perspective of the object, all motion occurs as if there were no gravitation whatsoever. It is only when observing the motion in a global sense that the curvature of space-time can be observed and the force is inferred from the object's curved path. Thus, the straight line path in space-time is seen as a curved line in space, and it is called the ballistic trajectory of the object. For example, a basketball thrown from the ground moves in a parabola, as it is in a uniform gravitational field. Its space-time trajectory (when the extra ct dimension is added) is almost a straight line, slightly curved (with the radius of curvature of the order of few light-years). The time derivative of the changing momentum of the object is what we label as "gravitational force". The electrostatic force was first described in 1784 by Coulomb as a force which existed intrinsically between two charges. The properties of the electrostatic force were that it varied as an inverse square law directed in the radial direction, was both attractive and repulsive (there was intrinsic polarity), was independent of the mass of the charged objects, and followed the law of superposition. Coulomb's Law unifies all these observations into one succinct statement. where q is the magnitude of the hypothetical test charge. where I is the magnitude of the hypothetical test current and is the length of hypothetical wire through which the test current flows. The magnetic field exerts a force on all magnets including, for example, those used in compasses. The fact that the Earth's magnetic field is aligned closely with the orientation of the Earth's axis causes compass magnets to become oriented because of the magnetic force pulling on the needle. where is the electromagnetic force, q is the magnitude of the charge of the particle, is the electric field, is the velocity of the particle which is crossed with the magnetic field ( ). The origin of electric and magnetic fields would not be fully explained until 1864 when James Clerk Maxwell unified a number of earlier theories into a succinct set of four equations. These "Maxwell Equations" fully described the sources of the fields as being stationary and moving charges, and the interactions of the fields themselves. This led Maxwell to discover that electric and magnetic fields could be "self-generating" through a wave that traveled at a speed which he calculated to be the speed of light. This insight united the nascent fields of electromagnetic theory with optics and led directly to a complete description of the electromagnetic spectrum. However, attempting to reconcile electromagnetic theory with two observations, the photoelectric effect, and the nonexistence of the ultraviolet catastrophe, proved troublesome. Through the work of leading theoretical physicists, a new theory of electromagnetism was developed using quantum mechanics. This final modification to electromagnetic theory ultimately led to quantum electrodynamics (or QED), which fully describes all electromagnetic phenomena as being mediated by wave particles known as photons. In QED, photons are the fundamental exchange particle which described all interactions relating to electromagnetism including the electromagnetic force. It is a common misconception to ascribe the stiffness and rigidity of solid matter to the repulsion of like charges under the influence of the electromagnetic force. However, these characteristics actually result from the Pauli Exclusion Principle. Since electrons are fermions, they cannot occupy the same quantum mechanical state as other electrons. When the electrons in a material are densely packed together, there are not enough lower energy quantum mechanical states for them all, so some of them must be in higher energy states. This means that it takes energy to pack them together. While this effect is manifested macroscopically as a structural "force", it is technically only the result of the existence of a finite set of electron states. There are two "nuclear forces" which today are usually described as interactions that take place in quantum theories of particle physics. The strong nuclear force is the force responsible for the structural integrity of atomic nuclei while the weak nuclear force is responsible for the decay of certain nucleons into leptons and other types of hadrons. The strong force is today understood to represent the interactions between quarks and gluons as detailed by the theory of quantum chromodynamics (QCD). The strong force is the fundamental force mediated by gluons, acting upon quarks, antiquarks, and the gluons themselves. The strong interaction is the most powerful of the four fundamental forces. The strong force only acts directly upon elementary particles. However, a residual of the force is observed between hadrons (the best known example being the force that acts between nucleons in atomic nuclei) as the nuclear force. Here the strong force acts indirectly, transmitted as gluons which form part of the virtual pi and rho mesons which classically transmit the nuclear force (see this topic for more). The failure of many searches for free quarks has shown that the elementary particles affected are not directly observable. This phenomenon is called colour confinement. The weak force is due to the exchange of the heavy W and Z bosons. Its most familiar effect is beta decay (of neutrons in atomic nuclei) and the associated radioactivity. The word "weak" derives from the fact that the field strength is some 1013 times less than that of the strong force. Still, it is stronger than gravity over short distances. A consistent electroweak theory has also been developed which shows that electromagnetic forces and the weak force are indistinguishable at a temperatures in excess of approximately 1015 Kelvin. Such temperatures have been probed in modern particle accelerators and show the conditions of the universe in the early moments of the Big Bang. The normal force is the repulsive force of interaction between atoms at close contact. When their electron clouds overlap, Pauli repulsion (due to fermionic nature of electrons) follows resulting in the force which acts normal to the surface interface between two objects. The normal force, for example, is responsible for the structural integrity of tables and floors as well as being the force that responds whenever an external force pushes on a solid object. An example of the normal force in action is the impact force on an object crashing into an immobile surface. Friction is a surface force that opposes motion. The frictional force is directly related to the normal force which acts to keep two solid objects separated at the point of contact. There are two broad classifications of frictional forces: static friction and kinetic friction. where μkf is the coefficient of kinetic friction. For most surface interfaces, the coefficient of kinetic friction is less than the coefficient of static friction. Tension forces can be modeled using ideal strings which are massless, frictionless, unbreakable, and unstretchable. They can be combined with ideal pulleys which allow ideal strings to switch physical direction. Ideal strings transmit tension forces instantaneously in action-reaction pairs so that if two objects are connected by an ideal string, any force directed along the string by the first object is accompanied by a force directed along the string in the opposite direction by the second object. By connecting the same string multiple times to the same object through the use of a set-up that uses movable pulleys, the tension force on a load can be multiplied. For every string that acts on a load, another factor of the tension force in the string acts on the load. However, even though such machines allow for an increase in force, there is a corresponding increase in the length of string that must be displaced in order to move the load. These tandem effects result ultimately in the conservation of mechanical energy since the work done on the load is the same no matter how complicated the machine. Fk is the force that responds to the load on the spring. where k is the spring constant (or force constant), which is particular to the spring. The minus sign accounts for the tendency of the elastic force to act in opposition to the applied load. When the drag force (Fd) associated with air resistance becomes equal in magnitude to the force of gravity on a falling object (Fg), the object reaches a state of dynamical equilibrium at terminal velocity. where V is the volume of the object in the fluid and P is the scalar function that describes the pressure at all locations in space. Pressure gradients and differentials result in the buoyant force for fluids suspended in gravitational fields, winds in atmospheric science, and the lift associated with aerodynamics and flight. where A is the relevant cross-sectional area for the volume for which the stress-tensor is being calculated. This formalism includes pressure terms associated with forces that act normal to the cross-sectional area (the matrix diagonals of the tensor) as well as shear terms associated with forces that act parallel to the cross-sectional area (the off-diagonal elements). The stress tensor accounts for forces that cause all deformations including also tensile stresses and compressions. There are forces which are frame dependent, meaning that they appear due to the adoption of non-Newtonian (that is, non-inertial) reference frames. Such forces include the centrifugal force and the Coriolis force. These forces are considered fictitious because they do not exist in frames of reference that are not accelerating. In general relativity, gravity becomes a fictitious force that arises in situations where spacetime deviates from a flat geometry. As an extension, Kaluza-Klein theory and string theory ascribe electromagnetism and the other fundamental forces respectively to the curvature of differently scaled dimensions, which would ultimately imply that all forces are fictitious. is the force acting on the particle. is the angular acceleration of the particle. This provides a definition for the moment of inertia which is the rotational equivalent for mass. In more advanced treatments of mechanics, the moment of inertia acts as a tensor that, when properly analyzed, fully determines the characteristics of rotations including precession and nutation. where m is the mass of the object, v is the velocity of the object and r is the distance to the center of the circular path and is the unit vector pointing in the radial direction outwards from the center. This means that the unbalanced centripetal force felt by any object is always directed toward the center of the curving path. Such forces act perpendicular to the velocity vector associated with the motion of an object, and therefore do not change the speed of the object (magnitude of the velocity), but only the direction of the velocity vector. The unbalanced force that accelerates an object can be resolved into a component that is perpendicular to the path, and one that is tangential to the path. This yields both the tangential force which accelerates the object by either slowing it down or speeding it up and the radial (centripetal) force which changes its direction. which, by Newton's Second Law, must be equivalent to the change in momentum (yielding the Impulse momentum theorem). which is equivalent to changes in kinetic energy (yielding the work energy theorem). Forces can be classified as conservative or nonconservative. Conservative forces are equivalent to the gradient of a potential while non-conservative forces are not. where G is the gravitational constant, and mn is the mass of object n.
where ε0 is electric permittivity of free space, and qn is the electric charge of object n.
For certain physical scenarios, it is impossible to model forces as being due to gradient of potentials. This is often due to macrophysical considerations which yield forces as arising from a macroscopic statistical average of microstates. For example, friction is caused by the gradients of numerous electrostatic potentials between the atoms, but manifests as a force model which is independent of any macroscale position vector. Nonconservative forces other than friction include other contact forces, tension, compression, and drag. However, for any sufficiently detailed description, all these forces are the results of conservative ones since each of these macroscopic forces are the net results of the gradients of microscopic potentials. The connection between macroscopic non-conservative forces and microscopic conservative forces is described by detailed treatment with statistical mechanics. In macroscopic closed systems, nonconservative forces act to change the internal energies of the system, and are often associated with the transfer of heat. According to the Second Law of Thermodynamics, nonconservative forces necessarily result in energy transformations within closed systems from ordered to more random conditions as entropy increases. The SI unit of force is the newton (symbol N), which is the force required to accelerate a one kilogram mass at a rate of one meter per second squared, or kg·m·s−2. The corresponding CGS unit is the dyne, the force required to accelerate a one gram mass by one centimeter per second squared, or g·cm·s−2. A newton is thus equal to 100,000 dyne. An alternative unit of force in a different foot-pound-second system, the absolute fps system, is the poundal, defined as the force required to accelerate a one pound mass at a rate of one foot per second squared. The units of slug and poundal are designed to avoid a constant of proportionality in Newton's second law. The pound-force has a metric counterpart, less commonly used than the newton: the kilogram-force (kgf) (sometimes kilopond), is the force exerted by standard gravity on one kilogram of mass. The kilogram-force leads to an alternate, but rarely used unit of mass: the metric slug (sometimes mug or hyl) is that mass which accelerates at 1 m·s−2 when subjected to a force of 1 kgf. The kilogram-force is not a part of the modern SI system, and is generally deprecated; however it still sees use for some purposes as expressing jet thrust, bicycle spoke tension, torque wrench settings and engine output torque. Other arcane units of force include the sthène which is equivalent to 1000 N and the kip which is equivalent to 1000 lbf. ^ "glossary". Earth Observatory. NASA. http://eobglossary.gsfc.nasa.gov/Library/glossary.php3?mode=alpha&seg=f&segend=h. Retrieved 2008-04-09. "Force: Any external agent that causes a change in the motion of a free body, or that causes stress in a fixed body." ^ a b c d e f g h i j k l m n o p q r s t u v w x y z e.g. Feynman, R. P., Leighton, R. B., Sands, M. (1963). Lectures on Physics, Vol 1. Addison-Wesley. ; Kleppner, Daniel; Robert Kolenkow (1973). An Introduction to Mechanics. McGraw-Hill. pp. 133–134. ISBN 0070350485. .
^ a b Heath,T.L.. "The Works of Archimedes (1897). The unabridged work in PDF form (19 MB)". Archive.org. http://www.archive.org/details/worksofarchimede029517mbp. Retrieved 2007-10-14. ^ Hetherington, Norriss S. (1993). Cosmology: Historical, Literary, Philosophical, Religious, and Scientific Perspectives. Garland Reference Library of the Humanities. p. 100. ISBN 0815310854. ^ a b c d e f g Newton, Isaac (1999). The Principia Mathematical Principles of Natural Philosophy. Berkeley: University of California Press. ISBN 0-520-08817-4. This is a recent translation into English by I. Bernard Cohen and Anne Whitman, with help from Julia Budenz. ^ DiSalle, Robert (2002-03-30). "Space and Time: Inertial Frames". Stanford Encyclopedia of Philosophy. http://plato.stanford.edu/entries/spacetime-iframes/. Retrieved 2008-03-24. ^ Newton's Principia Mathematica actually used a finite difference version of this equation based upon impulse. See Impulse. ^ One exception to this rule is: Landau, L. D.; Akhiezer, A. I.; Lifshitz, A. M. (1967). General Physics; mechanics and molecular physics (First English ed.). Oxford: Pergamon Press. ISBN 0080033040. Translated by: J. B. Sykes, A. D. Petford, and C. L. Petford. Library of Congress Catalog Number 67-30260. In section 7, pages 12–14, this book defines force as dp/dt. ^ e.g. W. Noll, “On the Concept of Force”, in part B of Walter Noll's website..
^ Henderson, Tom (1996-2007). "Lesson 4: Newton's Third Law of Motion". The Physics Classroom. http://www.glenbrook.k12.il.us/gbssci/phys/Class/newtlaws/u2l4a.html. Retrieved 2008-01-04. ^ Dr. Nikitin (2007). "Dynamics of translational motion". http://physics-help.info/physicsguide/mechanics/translational_dynamics.shtml. Retrieved 2008-01-04. ^ "Introduction to Free Body Diagrams". Physics Tutorial Menu. University of Guelph. http://eta.physics.uoguelph.ca/tutorials/fbd/intro.html. Retrieved 2008-01-02. ^ Henderson, Tom (2004). "The Physics Classroom". The Physics Classroom and Mathsoft Engineering & Education, Inc.. http://www.glenbrook.k12.il.us/GBSSCI/PHYS/Class/vectors/u3l1b.html. Retrieved 2008-01-02. ^ "Static Equilibrium". Physics Static Equilibrium (forces and torques). University of the Virgin Islands. http://www.uvi.edu/Physics/SCI3xxWeb/Structure/StaticEq.html. Retrieved 2008-01-02. ^ Cutnell. Physics, Sixth Edition. John Wiley & Sons Inc. pp. 855–876. ISBN 047123124X. ^ "Seminar: Visualizing Special Relativity". THE RELATIVISTIC RAYTRACER. http://www.anu.edu.au/Physics/Searle/Obsolete/Seminar.html. Retrieved 2008-01-04. ^ Wilson, John B.. "Four-Vectors (4-Vectors) of Special Relativity: A Study of Elegant Physics". The Science Realm: John's Virtual Sci-Tech Universe. http://SciRealm.com/4Vectors.html. Retrieved 2008-01-04. ^ a b Shifman, Mikhail (1999). ITEP LECTURES ON PARTICLE PHYSICS AND FIELD THEORY. World Scientific. ISBN 981-02-2639-X. ^ Nave, R. "Pauli Exclusion Principle". HyperPhysics***** Quantum Physics. http://hyperphysics.phy-astr.gsu.edu/hbase/pauli.html. Retrieved 2008-01-02. ^ "Fermions & Bosons". The Particle Adventure. http://particleadventure.org/frameless/fermibos.html. Retrieved 2008-01-04. ^ Cook, A. H. (16-160-1965). "A New Absolute Determination of the Acceleration due to Gravity at the National Physical Laboratory". Nature 208: 279. doi:10.1038/208279a0. http://www.nature.com/nature/journal/v208/n5007/abs/208279a0.html. Retrieved 2008-01-04. ^ "Sir Isaac Newton: The Universal Law of Gravitation". Astronomy 161 The Solar System. http://csep10.phys.utk.edu/astr161/lect/history/newtongrav.html. Retrieved 2008-01-04. ^ Watkins, Thayer. "Perturbation Analysis, Regular and Singular". Department of Economics. San José State University. http://www.sjsu.edu/faculty/watkins/perturb.htm. ^ Kollerstrom, Nick (2001). "Neptune's Discovery. The British Case for Co-Prediction.". University College London. Archived from the original on 2005-11-11. http://web.archive.org/web/20051111190351/http://www.ucl.ac.uk/sts/nk/neptune/index.htm. Retrieved 2007-03-19. ^ Einstein, Albert (1916). "The Foundation of the General Theory of Relativity" (PDF). Annalen der Physik 49: 769–822. http://www.alberteinstein.info/gallery/gtext3.html. Retrieved 2006-09-03. ^ Cutnell. Physics, Sixth Edition. John Wiley & Sons Inc. p. 519. ISBN 047123124X. ^ Coulomb, Charles (1784). "Recherches théoriques et expérimentales sur la force de torsion et sur l'élasticité des fils de metal". Histoire de l’Académie Royale des Sciences: 229–269. ^ a b Feynman, Leighton and Sands (2006). The Feynman Lectures on Physics The Definitive Edition Volume II. Pearson Addison Wesley. ISBN 0-8053-9047-2. ^ Duffin, William (1980). Electricity and Magnetism, 3rd Ed.. McGraw-Hill. pp. 364–383. ISBN 0-07-084111-X. ^ Cutnell. Physics, Sixth Edition. John Wiley & Sons Inc. p. 940. ISBN 047123124X. ^ Cutnell. Physics, Sixth Edition. John Wiley & Sons Inc. p. 951. ISBN 047123124X. ^ Stevens, Tab (10/07/2003). "Quantum-Chromodynamics: A Definition - Science Articles". http://www.physicspost.com/science-article-168.html. Retrieved 2008-01-04. ^ Cutnell. Physics, Sixth Edition. John Wiley & Sons Inc. p. 93. ISBN 047123124X. ^ "Tension Force". Non-Calculus Based Physics I. http://www.mtsu.edu/~phys2010/Lectures/Part_2__L6_-_L11/Lecture_9/Tension_Force/tension_force.html. Retrieved 2008-01-04. ^ Fitzpatrick, Richard (2006-02-02). "Strings, pulleys, and inclines". http://farside.ph.utexas.edu/teaching/301/lectures/node48.html. Retrieved 2008-01-04. ^ "Elasticity, Periodic Motion". HyperPhysics. Georgia State University. http://hyperphysics.phy-astr.gsu.edu/hbase/permot2.html. Retrieved 2008-01-04. ^ Mallette, Vincent (1982-2008). "Inwit Publishing, Inc. and Inwit, LLC -- Writings, Links and Software Distributions - The Coriolis Force". Publications in Science and Mathematics, Computing and the Humanities. Inwit Publishing, Inc.. http://www.algorithm.com/inwit/writings/coriolisforce.html. Retrieved 2008-01-04. ^ "Newton's Second Law for Rotation". HyperPhysics***** Mechanics ***** Rotation. http://hyperphysics.phy-astr.gsu.edu/HBASE/n2r.html. Retrieved 2008-01-04. ^ Fitzpatrick, Richard (2007-01-07). "Newton's third law of motion". http://farside.ph.utexas.edu/teaching/336k/lectures/node26.html. Retrieved 2008-01-04. ^ Nave, R. "Centripetal Force". HyperPhysics***** Mechanics ***** Rotation. http://hyperphysics.phy-astr.gsu.edu/hbase/cf.html. ^ a b Feynman, Leighton & Sands (1963), vol. 1, p. 13-3. ^ Feynman, Leighton & Sands (1963), vol. 1, p. 13-2. ^ Singh, Sunil Kumar (2007-08-25). "Conservative force". Connexions. http://cnx.org/content/m14104/latest/. Retrieved 2008-01-04. ^ Davis, Doug. "Conservation of Energy". General physics. http://www.ux1.eiu.edu/~cfadd/1350/08PotEng/ConsF.html. Retrieved 2008-01-04. ^ a b c d e Wandmacher, Cornelius; Johnson, Arnold (1995). Metric Units in Engineering. ASCE Publications. p. 15. ISBN 0784400709. Corbell, H.C.; Philip Stehle (1994). Classical Mechanics p 28,. New York: Dover publications. ISBN 0-486-68063-0. Cutnell, John d.; Johnson, Kenneth W. (2004). Physics, Sixth Edition. Hoboken, NJ: John Wiley & Sons Inc.. ISBN 041-44895-8. Feynman, R. P., Leighton, R. B., Sands, M. (1963). Lectures on Physics, Vol 1. Addison-Wesley. ISBN 0-201-02116-1. Verma, H.C. (2004). Concepts of Physics Vol 1. (2004 Reprint ed.). Bharti Bhavan. ISBN 81-7709-187-5.